Last night I attended a fermentation workshop with Haiku Foods hosted by Among the Colors in the Taxi development here in Denver. With the large garage door slid open to the summer evening breeze, we sampled sprouted seed crackers, organic blackberries, three different kinds of kraut, and sipped on Riesling (which is what you pair with sauerkraut, who knew!? ), kombucha, and ginger beer. I had met Hannah, from Haiku foods, at the Paleo Pop Up at Crossfit Verve a few weeks ago. Her warm demeanor and fascinating story of how she embraced real foods, especially fermented ones, to heal her gut and her lifelong struggles with asthma, allergies, rashes, and other ailments pulled me in. All of this backed up with seriously delicious krauts and sprouted crackers all made right here in Denver, I knew Haiku foods was legit and a company I wanted to support. We met again this week at Black Eye Coffee (along with KO Alliance--->> check her out, she's bringing together some seriously awesome companies, athletes, and entrepreneurs all in the name of making Colorado a healthier, more fit place) and I learned she was running a fermentation workshop. I immediately whipped out my checkbook and signed up! As a nutrition consultant, my clients look to me for practical recommendations they can incorporate into their diets. It's my mission to grow the Go Primal community by finding great companies and people who embrace the Real Food way of life and let you know about their products. It can feel like you are alone or some sort of hippie-weirdo when you first embark on the Go Primal lifestyle. But, there are many of us out there and more and more great companies that are making it easier for us by offering thoughtful, healthy products. You guys know that Health Begins In The Gut! (If you've taken my Advanced Class, we have a whole week all about digestion because it is so important.) As humans evolved, we grew right along with certain bacteria. These little guys aren't just along for the ride. They help keep our bodies balanced, fight off pathogens, and digest our food. This area of research (our micro biome) has exploded recently, beginning withe the Human Genome Project and I find it all so fascinating. Our bodies are actually more bacteria than human! If you look at the percentage of bacteria cells vs. human ones, it's 10 to 1. The bacteria living in and on us can weigh 3-5 lbs. That's amazing to me considering how small bacteria are! Traditional diets around the world include fermented foods. It's part of our evolution and history. In India, they ferment chutneys, yogurt, and cheese. Germans make sauerkraut. Koreans have kimchi. Obviously this was due to the need to preserve food, but now we know that these foods feed the good bacteria in our guts. In modern America, we really don't have any traditional fermented foods, so many of us don't get this daily dose of good bacteria. This can cause many problems because having a balanced gut flora supports the immune system and reduces inflammation in the body. For example, lactobacillus protects us by inhibiting pathogenic bacteria and is antimicrobial due to its pH balance. In the fermentation workshop, we made sauerkraut. It was so easy and fun! Hannah brought cabbage, carrots, and daikon along with different spices like turmeric, garlic, ginger, cumin, dill, and caraway. We massaged the sliced cabbage with sea salt to release the water, added the spices, then filled mason jars with the mixture and the liquid. Hannah told us to leave a bit of space at the top because the kraut will expand. 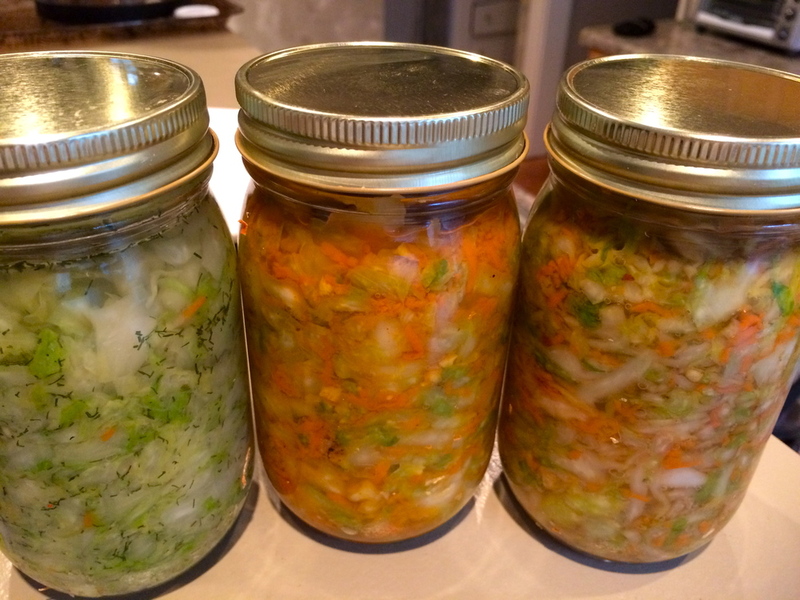 I'll let it sit in my kitchen for 1-5 weeks and then I'll have delicious, probiotic, fermented cabbage to add to my daily routine! Yay! Gut and the Psychology Syndrome, McBride.